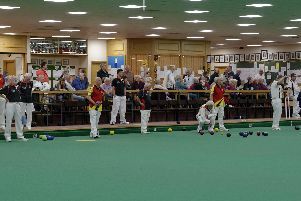 VICTORY saw their quest for indoor national inter-club championship glory ended by eventual winners the Carlisle-based Cumbria club. Unfortunately, the Portsmouth outfit lost 82-69 in the semi-finals of the competition called the Denny Cup. The rink of Charlie Bailey, Trevor Bailey, Adrian Snook and Barry Starks lost out 22-16. Dale Evers, Lenny Reecves, Adam Clark and Colin Thresher won their rink 20-15. Dave Watts, Paul Lawrence, Danny Smith and John Biggs lost their rink 23-13. And Martin Wake, Adrian Ash, John Legget and Gary Starks were edged out 22-20. Portsmouth Victory’s Charlie Bailey and Barry Starks combined to the reach the final of the national men’s over-60 pairs competition. They unfortunately lost in a hard-fought final to Essex County duo John Andrews and John Stewart 15-6. Over 17 gruelling ends there was never a three recorded on the scorecard – only 13 singles and four doubles. Bailey and Starks beat Adur 18-11 in the semi-finals and had seen off Riverain 19-11 in the last eight. In the Hampshire finals the two-wood triples was a close match as the Palmerston team of Tony Farrington, Jeff Passmore and Bill Ross ran out winners 23-13 against Banister Park. Palmerston’s Bill Jackson won a superb match against Russell Gadd 21-19 to take the Hampshire singles title. It was a great contest with Gadd leading only for Jackson to hit back. The pair were level at 17-17 after 25 ends but then Jackson won three of the final four ends. Victory triples team Martin Wake, Danny Smith and Gary Starkssealed the county title with a 25-11 win in the final against their club-mates Tom Pullin, Dale Evers and Adrian Ash. Portsdown won the Lavant short mat bowls annual invitation fours tournament. Nine teams from across Sussex, Hampshire and Surrey took part. The competition was very close. Portsdown drew their first match but won the next three. They knew two more wins would give them the title ahead of Crablands. And they kept their cool to achieve the success ensuring also they remained unbeaten throughout. It was a great day of bowling and £385 was raised for the Lavant Memorial Hall.